WHAT IS IT? EVS’ Technical Under Gear (TUG) Fusion knee brace socks are breathable, rugged socks that protect your entire leg from the abrasion of knee braces. WHAT STANDS OUT? Here’s a list of things that stand out with EVS’ TUG Fusion knee brace socks. (1) Feel. The EVS Technical Under Gear Fusion knee brace socks are very comfortable. They are soft against the skin and do not slide down. The actual sock part of the Fusion knee brace sock is woven from cotton with a reinforced toe and heel area. The cotton is thick and comfy, even when wedged into a tight-fitting boot. The portion of the sock that extends above the ankle is separated from the calf, knee and thigh section by a 2-inch-wide, expandable stretch panel that can be extended to 3 inches. This stretch panel separates the cotton sock from the Lycra upper—which extends above mid-thigh. At the top of the knee brace sock is a 1-1/4-inch elastic band that grips your leg with a coated 1/2-inch band of silicone rubber to keep the sock from sliding down. The final touch is gum rubber strips on the thigh and ankle for the knee braces to adhere to. (2) Durability. MXA test riders had no problem with the EVS knee brace socks ripping at the seam between the spandex/polyester material and the cotton bottom material. The upper cuff has lots of tension to keep it from stretching. (3) Sizes. The Fusion socks are available in three sizes (small, medium and large) and combine three different materials to optimize performance. The top half is flexible and ventilated, while the cotton bottom is intelligently cushioned to support the contours of your foot. (4) Colors. 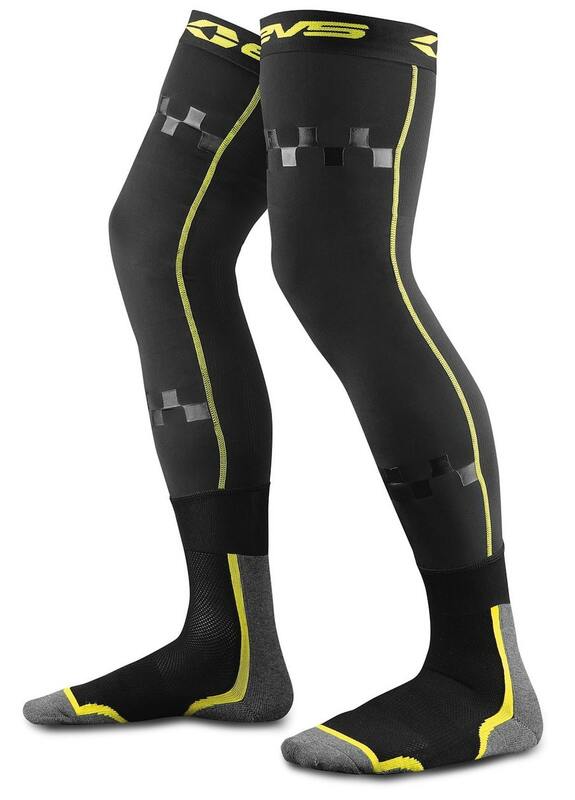 EVS TUG Fusion knee brace socks are offered in one color combination—black with yellow piping. 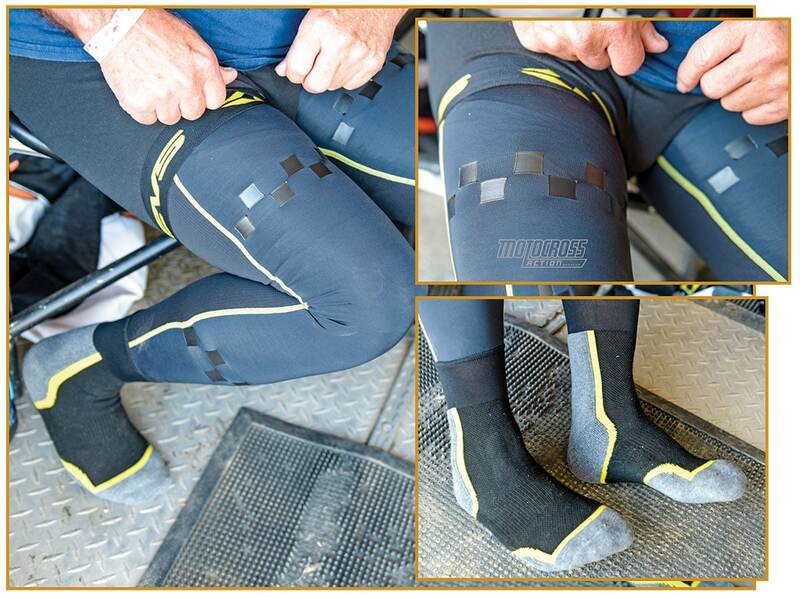 The yellow piping is actually a triple-stitched seam that separates the non-vented Lycra on the front half of the upper sock from the vented Lycra on the back of the rider’s leg. Amazingly, test riders loved the yellow stripe. They felt that it looked good and helped them get the sock on perfectly straight. MXA RATING: The TUG Fusion socks are well thought out, very comfortable and attractive-looking (something that matters very little for a piece of apparel that is hidden from sight).